Hi-Force, a leading designer, manufacturer and supplier of hydraulic tools, is able to offer bespoke onsite bolting services designed to maintain the integrity of bolted joints across multiple industries, where the safe movement of hydrocarbons in a leak free environment is absolutely critical. "To complement Hi-Force’s extensive range of bolting tools, our onsite bolting services are tailored to suit unique customer requirements," says group marketing director Laura Thompson. Customers can select the required support which extends to manpower and supervision from Hi-Force’s highly competent team of technicians, tool sale or rental agreements, training, as well as its innovative bolted joint integrity software, BoltRight Pro and Flange Management database. Hi-Force’s flexible approach to offering clients the individual components of its onsite service capabilities ensures a cost-effective and satisfactory service. "Our onsite bolting containers offer an onsite storage of purchased or leased bolting equipment, an Engineering Construction Industry Training Board (ECITB)-approved training rig for onsite training and demonstration purposes as well as a repair facility for any service and maintenance required for the tools during their time onsite, limiting costly time delays," she says. 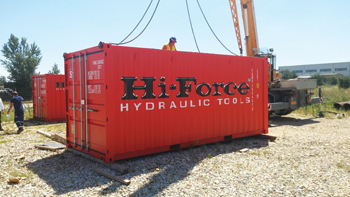 Hi-Force’s onsite containers include appropriate tool storage facilities, an air-conditioned environment, onsite training equipment, compressed air and a wide range of spare parts and additional tooling. Hi-Force’s onsite bolting solutions include: full technical support and advice during pre-construction phase; tooling specification for correct tightening of all bolts and joints, available for both purchase and rental; special tooling for unique customer requirements, designed and manufactured by Hi-Force; bolting software and flange management database; fully equipped, purpose designed and air-conditioned onsite tool store container; air-conditioned repair and training container, complete with ECITB-approved training rig for onsite training and demonstration purposes as well as repair and maintenance facilities, limiting costing time delays; qualified and experienced onsite bolting crews, supervisors and trainers and ECITB-approved training for contractors bolting crews.